Mariner an t-ainm a tugadh ar shraith spásárthach a lainseáil NASA chun tosú ar thaiscéaladh an Ghrianchórais inmheánaigh is sheachtraigh. 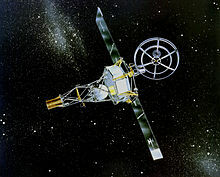 Chuimsigh an clár an chéad eitilt thar phláinéad (Mariner 2 a chuaigh thar Véineas i 1962), an chéad fhithiseoir pláinéadach (Mariner 9 a d'fhithisigh Mars i 1971), an chéad aistear go Mearcair (Mariner 10 i 1974 is 1975), agus an chéad mhionbhreathnú ar chórais Iúpatair, Satairn is Úránais (Mariner Iúpatair-Satairn, a athainmníodh Voyager, i 1979-1986). Díorthaíodh na spásárthaigh ón spásárthach Ranger a úsáideadh níos luaithe chun dul i dtír ar an nGealach. Ba de chlann Mariner fithiseoir Viking Marsa freisin. I 2004 lainseáladh an taiscéalaí Messenger go Mearcair, an chéad aistear Meiriceánach ar Mhearcair le 30 bliain. Shroich sé Mearcair i 2011, agus déanfaidh tástáil ar atmaisféar, comhdhéanamh is struchtúr an phláinéid. Tugadh an leathanach seo cothrom le dáta an 17 Bealtaine 2016 ag 04:30.